In June, Nielsen reported that data usage in the US was up 89%, and now just 6 months later, it’s no surprise to see that, according to the Mobile Media Report for Q3 2011, it turns out that US teens are contributing to yet another hike in mobile data usage, or as it has been dubbed, the mobile Data Tsunami. Overall, smartphone subscribers using mobile Internet has gone up by 45% in the past year, while actual smartphone ownership has more than doubled in the past couple of years, consistently led by the 18-24 age group. Mobile video viewing continues to rise incrementally with each quarter, with the highest increase seen just this quarter at 14%. The dominant activity taking place on smarpthones is mobile browsing, but the biggest increases have been seen in online game playing, increasing by 95%, followed by game downloading. According to the study, the Android OS is dominating the US smartphone scene with 44.2% of users on Samsung, HTC, Motorola and other Android phones, followed by Apple’s iOS at 28.6%. Blackberry trails with 17%. Android dominates in all age groups, followed also by Apple at about half of the figure. Google and Facebook are the most visited sites by both Android and iOS users. From the third spot on, their interests begin to diverge, with iOS users going for Twitter, Yahoo, Amazon and then Wikipedia. Surprisingly enough Twitter doesn’t even make it into the top 10 sites among Android users. Teen usage of mobile data has tripled in the past year, despite their apparent addiction to text-messaging. The study conducted by Nielsen analysed data usage from monthly bills of over 65,000 mobile subscribers in the US. According to the study, teens aged 13 to 17 have had the highest growth rate, shooting up by 256% to an average of 320MB of data per month. It’s interesting to find that male teens use about 100MB more than females, with an average of 382MB per month among males, compared to 266MB among females. To give the 256% increase context, the second highest growth rate, belonging to the 18-24 age group, is a significantly lower 147%. But teens aren’t the ones using the most data. 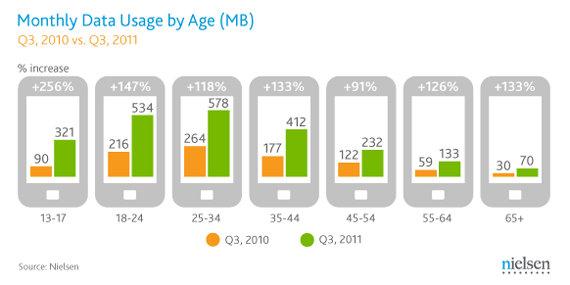 25-34 year olds consume the most data, averaging 578MB per month. Despite the advent of cross-platform smartphone messaging apps like Whatsapp, SMS and MMS messages are still very much a key part of teen mobile use. 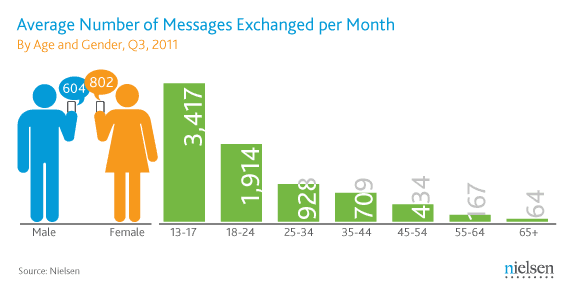 Teen girls send and receive a staggering 3,952 messages per month, while guys are averaging 2,815. The figure drops drastically in the next age group, with an average 1,914 messages in the 18-24 age group, and the figure continues to dwindle through each age-set, to just 64 messages per month in the 65+ age group. While text messaging is one of the top teen activities, all of the standard smartphone uses including mobile internet, social networking, email and app downloads, factor into teen smartphone data usage. The last thing that teens actually want to do with their phones is make phone calls. Voice calls have dropped from an average of 685 minutes to 572, because according to them, messaging is faster, easier and more fun.